This week, the American Institute of Architects announced the winners of the 2018 AIA New England Design Awards. The event, hosted annually at the Waterfront's BSA Space, honors individuals and organizations for their outstanding achievements in support of the profession of architecture. 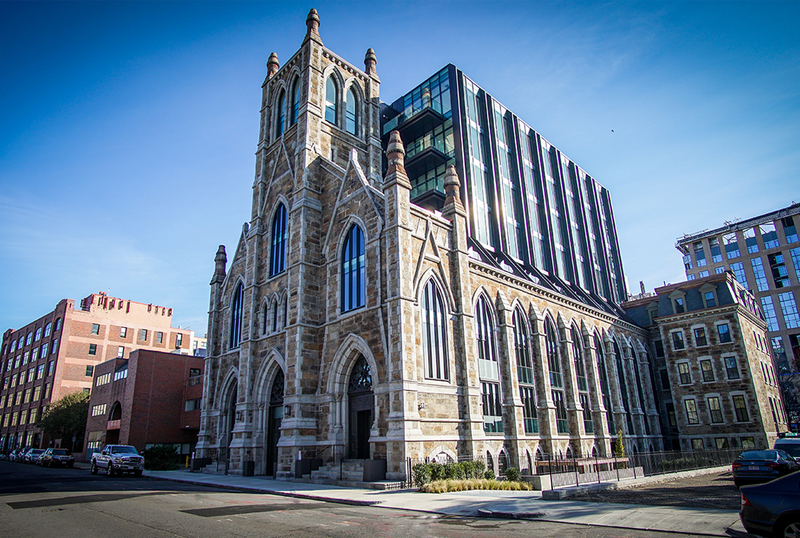 Conceptualized as a building within a building, The Lucas's steel and glass design rises out of the stone walls of the 1874 German Trinity Catholic Church. The development brought about a new level of luxury living to the desirable South End neighborhood. 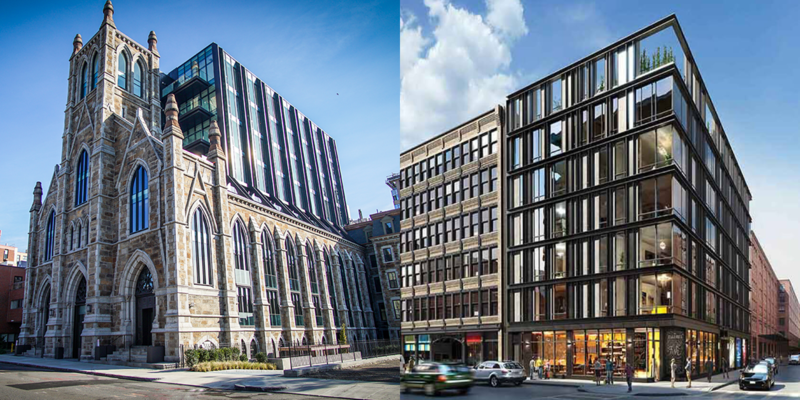 In a brilliant utilization of architectural design, the building blends old and new styles by maintaining the facade of the former church along with its stained glass and vaulted ceilings. Boston's South End is listed on the National Register of Historic Places and is a Boston Landmark District. It is the largest Victorian row house district in the country, made up of over 300 acres. Filled with chic art galleries, and home to 11 residential parks with central fountains and iron-fenced borders, the South End is a vibrant and exciting neighborhood. The area is a popular enclave of artists, galleries, unique shops and trendy restaurants. The Lucas thoughtfully represents the harmony of classic architecture and modern elegance brought about by its use of contemporary design. Residents will feel at home with luxurious amenities including a state-of-the-art fitness room and lounge, a common courtyard, and a professionally managed concierge. This 2 bedroom, 2.5 bathroom home features built-in smart home equipment including a dedicated Apple iPad that control Lutron lighting, Sonos stereo system, Nest thermostat, video intercom and other high tech features. European kitchen showcases Thermador appliances, gas cook-top and granite counter tops. Stunning architectural windows, gas fireplace, high ceilings, recessed lighting, hardwood floors, and extraordinary high-end finishes throughout. Master suite showcases walk-in closet, frameless glass shower with floor-to-ceiling tiles, Grohe fixtures, heated floors, and dual bathroom vanities. The nine luxury residences at 10 Farnsworth have brought about an atmosphere of exceptional luxury living to the Seaport's Fort Point district. Brilliant detailing and professional craftsmanship have gone into construction of these boutique residences. 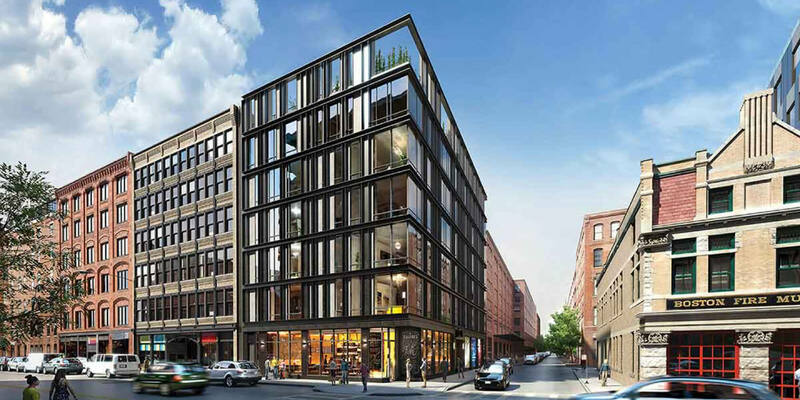 10 Farnsworth thoughtfully reflects the designs of 19th and 20th century industrial buildings along Congress Street, offering contemporary detailing and complementing an atmosphere of elegant modernity to the neighborhood. Its exposed metal and glassy facades combine both old and new styles in graceful harmony. Residents will enjoy supreme building amenities including an automated parking system and combination of shared and private roof gardens including outdoor kitchens, living and dining areas. Floor plans at 10 Farnsworth are both open and dramatic. Complementing the layout are floor-to-ceiling windows that drench the homes in sunlight and offer unmatched city views. Central air, gas fireplaces and radiant flooring ensure residential comfort at all times year round. The best of 21st century customizable Smart Home technology works through your Android or iOS smartphone, allowing automated control of lights, media, music, blinds and security systems. The South Boston Waterfront and Seaport districts are in the midst of a renaissance. Neighborhood amenities abound and, coupled with the location across from downtown—just off Boston’s major highway and a short T ride to the airport—10 Farnsworth has become a premiere residence in the Boston landscape. Stroll along Fort Point Channel’s artist studios and signature restaurants. The Institute of Contemporary Art and Boston Children’s Museum live here, as do some of the best restaurants around. Live in the heart of Fort Point and Seaport District! Stunning 3 bedroom 2 1/2 bathroom home boasts direct elevator access, garage parking and a common roof terrace with gas fireplace and skyline views. With only 9 homes in the building, one can enjoy the ultimate privacy while surrounded by the vibrancy of such a bustling neighborhood. The chef's kitchen boasts marble countertops, custom European lacquer cabinetry, and Gaggenau appliances. Gas fireplaced living room, wide plank European oak flooring, Italian built-in wardrobes, and central A/C complete this magnificent home.